The Mars Science Laboratory hasn’t had her wheels down for a day and already the Curiosity-inspired builds are rolling in. [Will] and [Doug] built a LEGO model of the Curiosity rover for the Build the Future in Space event at NASA’s Kennedy Space Center. Everything on this scaled-down version of Curiosity is completely made out of LEGO, including the four powered wheels, motorized mast, and articulated, controllable arm. The LEGO rover contains 7 NTX bricks, 13 motors, two power function motors, and over 1000 pieces of LEGO held together without any glue. The rover is under remote control from two operators. The driver controls the rotation and direction of the four powered corner wheels, while another operator uses a Waldo-like manipulator built out of LEGO to move Curiosity‘s mast and arm. Each of these controls communicate with the rover over a Bluetooth connection. We’ve been wondering when we would see a Curiosity-inspired rocker bogie bot, and we’re pleased as punch the first one just happened to be a LEGO build. Having [Will] and [Doug] time their submission to the Curiosity’s landing on Mars is the icing on the cake. You can see the LEGO Curiosity in action after the break. I’m curious.. was this made deliberately to improve HAD pagerank? You do realise this is just relevant curation, check the source, it was posted today as well. Maybe they (the source) held out waiting for today to post this. don’t get me wrong, I don’t deny that its pretty nice, but I really think it was a deliberate plug to boost pagerank. For want of a better word for my approval… this is badass! 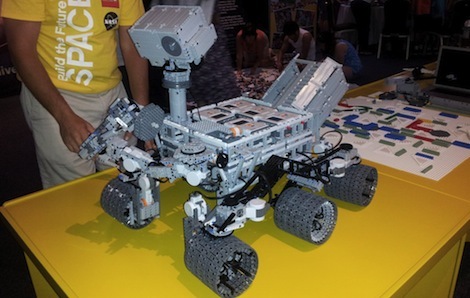 Does the LEGO version have JPL imprinted on the wheels in Morse code like the real one? Is that seriously what those holes in the wheels were? I was watching animations of the rover and was curious why there were holes in the wheels..